How to get this coupon. 2)Recharge or pay with minimum Rs. 10. 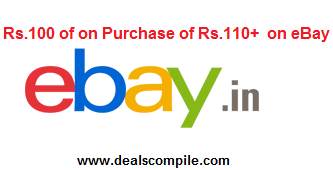 3)Select Ebay coupon and proceed with payments. -You will receive an e-coupon code via e-mail as soon as your recharge/bill payment transaction on the FreeCharge mobile application is successfully completed. -You will need to apply the coupon code at the time of placing the order on Ebay.in mobile platform (app or m-web only). -Choose the product and apply the received coupon on your product which is worth atleast Rs.110 and you will get Rs.100 off. -Only one code can be redeemed per transaction. -Offer cannot be combined with any other offers. -Offer valid for new and existing users both. -Valid till 15th January 2015.